Neighbours actress Eve Morey has revealed that Callum Rebecchi (Morgan Baker) is to explore his "darker side" in an upcoming storyline. The actress explained that the change in Morgan - the son of Sonya and Jarrod 'Toadie' Rebecchi (Ryan Moloney) - has complex causes. "I can tell you [his rebellion is] starting," PA quotes Morey as saying. "And it's actually really good, because we're doing a few storylines now, where he's starting to explore that darker side of being a teenager. And I think that's really good for him. "And I think it's good for the audience to see it, because sometimes I'm like, 'Wow this kid's so well-adjusted'. And that's really great, but at the same time it must be difficult. "So we sort of start to see a bit of that pent-up anger start to come out, brought on by other storylines. It's a bit more complex. It's great." Discussing Callum's troubled past, she continued: "What he's been through, this poor kid! "Mother left him at 4 because she was a drug addict. He lived with his gran, she got too sick and he was fostered out and his mother comes back and lies to him for two years about who she is, and then finally there's a resolution. "I'm surprised at how well he's taking it. He's had to grow up very quickly and be very emotionally mature." Morey recently confessed that she has become broody in real life as a result of doing scenes with Sonya's new baby Nell (Scarlett Anderson). Neighbours star Morgan Baker has answered fan questions in an online video chat. 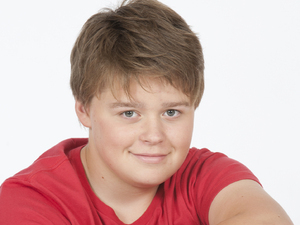 Baker, who plays Ramsay Street's Callum Rebecchi, talks about celebrity crushes, his favourite storylines and more. He also reveals that his most challenging storyline so far has been the Callum, Bailey and Rani love triangle which takes a dark turn when the boys have a fight. Neighbours actor Morgan Baker has decided to leave the soap, Digital Spy can confirm. The 16-year-old is bowing out from his role as Callum Rebecchi in order to concentrate on his schoolwork full-time. Callum's exit storyline is expected to air in June, but details of how he is being written out have yet to be revealed. A Neighbours spokesperson told Digital Spy: "Morgan has made the very mature decision to focus on his final years at high school and while we will all miss him enormously, we also commend him for making this move. He has established himself as an incredibly talented young actor. "However, like many of our characters that leave, many return and we would love to see him back on Ramsay Street at some stage even for just a quick visit." Baker has been playing the role of Toadie Rebecchi's adopted son since 2008, making him the longest-serving of the show's younger cast. Callum's biggest storyline to date aired in 2011, when he was shocked to discover that his biological mum was Toadie's girlfriend Sonya (Eve Morey). The Ramsay Street schoolboy was also caught up in a love triangle with neighbour Rani Kapoor (Coco-Jacinta Cherian) and best friend Bailey Turner (Calen Mackenzie) last year. More recently, he has developed a new relationship with fellow student Josie Lamb (Madison Daniel). Neighbours star Morgan Baker has revealed that Toadie and Sonya Rebecchi will struggle to hide their marriage problems from their son Callum in future episodes. The 16-year-old actor, who bows out on screen as Callum later this year, confirmed that the couple's troubles aren't yet over. Tension has flared up between Toadie (Ryan Moloney) and Sonya (Eve Morey) in recent weeks as they have struggled to find quality time for each other. Sonya also upset Toadie by getting overly involved in the life of Jacob Holmes, a single dad who developed feelings for her. Meanwhile, a future storyline will see newcomer Naomi Canning fall for Toadie, leaving fans to wonder whether he will be tempted by her. Confirming that Callum will be affected by the drama to come, Baker told Digital Spy: "Callum is at an age now where it is difficult to keep things from him. Sonya and Toadie have been through so much since they met, so I think it would have to take something pretty big to break up these two - but I guess all relationships have a limit to how much each party can take. "I hope it doesn't come to that. I think Callum would be pretty devastated because he is finally settled. It would be a major adjustment." Toadie and Sonya struggle with Angie's arrival. On Callum's future storylines, he continued: "Coming up, the family dynamics definitely dominate Callum, and there is a more serious issue with Bailey which he becomes involved in. "Callum has also been with his girlfriend Josie for a few months now, and they've kind of reached a key point in the relationship - the 'next' step, and while they've been very calm and genuine about it, Sonya and Toadie are a little shocked, to say the least. "Josie is such a strong character who has a big influence over Callum and they also have a lot of fun together. I love getting to play out the actual successful romance that Callum has been wanting for so long." Callum tells Josie how he feels. Last week, it was confirmed that Callum will be leaving Ramsay Street in June, as Baker has decided to concentrate on his schoolwork full-time after six years in the role. Reflecting on his time with the show, he said: "It's been an absolute privilege. I've met and worked with so many amazing people over the years, and many of them are now my closest friends. "It's so strange to see old footage of myself from when I first started, and it just gives me fits of laughter whenever I talk in that high-pitched, pre-pubescent voice. Growing up around everyone at Neighbours has given me so many positive role models and fun, like-minded individuals to bounce off, which I'm so grateful for. "Working with Ryan and Eve has also been an absolute highlight of working at Neighbours, and they've just been the best TV parents ever. They've passed on so much insight and acting counsel, which has helped me immeasurably." Is this the start of Callum's leaving storyline, I wonder? He's obviously an undiscovered game programming genius who'll have to move away to go to a special school/college of some sort to make the most of his talent. That's never happened before on Neighbours! Neighbours star Morgan Baker has discussed his reasons for leaving the show, adding that he hasn't ruled out a return to the soap in the near future. It was announced earlier this year that the 16-year-old would be departing his role as Callum Rebecchi, with his final scenes airing in the UK later this month. Callum's exit storyline will see him head over to America on a scholarship, while off-screen Baker made the decision in order to focus on his school commitments full-time. Speaking to Tenplay, Baker said: "I never say never to returning, but it just depends on my situation once I finish school and where I'm at and what I feel like doing. "I want to continue acting, I just want to put it onto the backburner for a little bit. It also would depend on if they wanted me!" Discussing his decision to leave the show, Baker added: "I've always wanted to finish school as it's very important to me. But each year it's become progressively more difficult to do it. "As my work load has increased and my school load has increased it has become harder and harder where it just got to the point around the second half of last year where I was like, this is getting really difficult." Baker also heaped praised onto Ryan Moloney and Eve Morey, who play Callum's parents Toadie and Sonya Rebecchi. He said: "Right from day one Ryan has been an absolute pleasure to work with, great mentor figure, and he has given me so much guidance, which has been great. "Eve Morey has been amazing to work with too, I have absolutely loved working with her. I loved working with Kaiya Jones and Colette Mann, although I never get enough scenes with her. "And of course Calen Mackenzie, that little rugrat. I love working with him."